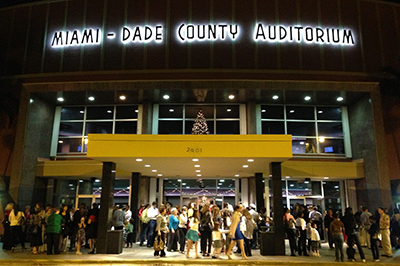 Miami-Dade County Auditorium (MDCA) offers two dynamic presentation styles: a 2,372-seat theater that can host major dance, theater and music performances; and a 250-seat “On Stage Black Box” theater in which both the audience and performers share the stage of the Auditorium which is adapted into an innovative studio theater for more intimate and often, cutting edge shows. Since the theater opened its doors in 1951, it has served as the center for showcasing the diversity of our cultural life and most recently, as a hub for celebrating the Hispanic arts community. The Department has launched a program to establish co-presenting partnerships with non-profit cultural organizations that can present performances on the main stage and in the black box configuration and begin to establish an artistic reputation for the theater which will encourage more use and presentations of higher artistic quality. Partner organizations include Fundarte, the Rhythm Foundation, Tigertail, the Performing Arts Series presented by Miami Dade College and Teatro Avante. This program also has the benefit of helping to develop Hispanic audiences for some of our community’s premiere cultural organizations.